Building good Distribution Channel is most important aspect of any business. Distribution channel also known as Distribution Chain. All sales effort become zero if company don’t have good distribution channel. Timely availability of products at required place is prime motive of any distribution channel. As we have discussed in previous article about marketing sales types in pharma industry. Now we will discuss about how to establish and build a strong distribution network? Market survey is most important thing before start. It will help in creating strong network. 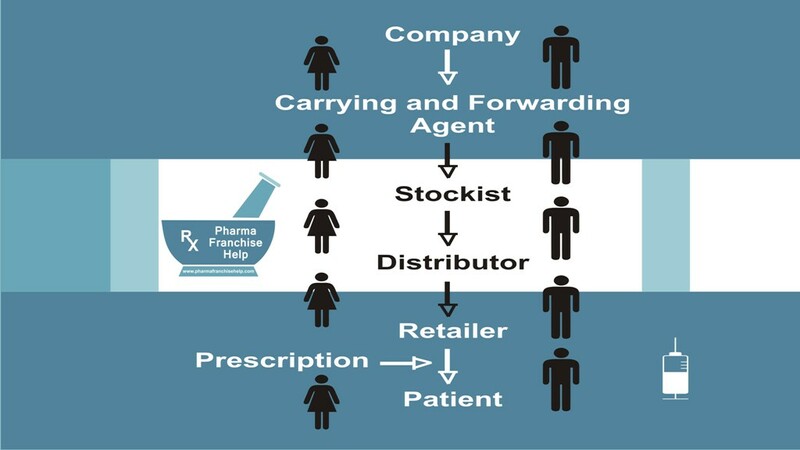 For building strong distribution channel for pharmaceutical marketing, we need to understand how can we distribute our products in simple and effective way. Try to make it short and simple. Involvement of less persons will be prevent cost of product and time & chances of mistakes will be lesser as compare to bigger distribution channel. A Distribution Channel may be defines as a chain of individuals/groups/firms/companies involved into delivery a product from manufacturing unit to its actual consumer. In prescription marketing, we can also involve doctors in distribution channel, without prescription, its not possible to deliver a medicine to patient but we don’t consider a doctor in distribution channel. A Distribution channel chart flow is shown into image below. 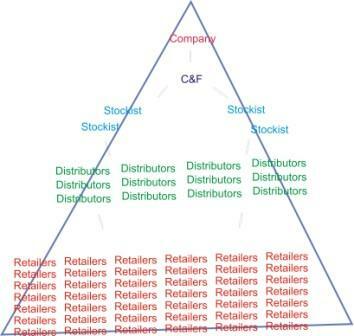 Retailers are more in numbers as compare to distributors, Stockists is less than distributors and same is follow-up. How to Build a Strong Distribution Channel? Doctors are the main source of business, so should concentrate at doctors,hospitals and nearby retailers/chemist. Appoint C&F for a region or particular state. Then appoint Stockist at particular number of distributors for product’s supply to these distributors. Appoint Distributors at particular number of chemists or hospitals or regions etc. Retailers/chemists are the main source of business. Other than these, hospitals are also provide good business. Pcd pharma distributors are the main source of business. For pcd pharma companies, development of strong distribution network, method is different from above two methods. In this marketing type, one need to have high number of queries that are searching for own marketing. Companies has to compete with other companies to finalized the deal with this query. Company having better opportunities gets the deal. For pcd pharma distributors, they can develop their distribution network further like mentioned in ethical/Branded marketing. In OTC marketing customers are main source of business but chemists and distributors/stockists also play important role. Other than this, Doctor’s recommendation also provide great support. Then appoint Stockist at particular number of distributors for product’s supply to these distributors. Appoint Distributors at particular number of chemists or regions etc. Read below query to understand distribution channel for surgical and medical device marketing. You should search for distributors who work mainly work of surgical and medical device products. Pharma Distributors will not help you most. For regions and states you can appoint c&f and for 2 to 3 districts you can appoint one stockist. If possible, district wise you can appoint distributors. Appointment of stockists and distributors and area you will given to them at sale of products. If sale is huge then you can divide it district wise. If sale is comparatively low then appointing distributor or stockist for 2 to 3 district will be enough. Specialty of Hospitals i.e. Surgeon, Gynae, pediatric etc. On Basis of Above Facts, you can choose area, that could be covered by one distributor. Hi, Thank You for such a one-stop blog for all matters related to all sides of Pharma business. What all licenses i need to have to start a pharmaceutical, OTC and medical device warehouse (no trading) – say for example at Delhi NCR or at Bangalore? Is it different from state to state? Is obtaining these licenses from govt authorities much difficult – how many licenses in total i should have for this venture? If you are going to store/stock or warehouse any of pharmaceutical and medicinal related products, you need drug license from state drug authority at district level where your warehouse is located. General requirements are same as per drug and cosmetic act for all states but difficulty in getting license is vary state to state. Deposit require by the company vary company to company. Its not fix. It depend at your mutual agreement with company.